A week ago, I posted about some new blogs I’d come across and invited you, my readers, to share with me any blogs that you thought I might be interested in, hoping to find some more like-minded mamas out there in the blogosphere. Fast forward to Feb. 13, when I received an emailed invitation to join a site called Maya’s Mom. The invite stated “…you can easily and seamlessly expose your blog to new readers by importing a feed into your Maya’s Mom journal. All entries will appear as new and link back to your personal blog!” I’m always interested in expanding my blog readership so I checked it out and signed up. I didn’t plan on getting too involved there, because I don’t have the time to commit to something else. However, as I perused the site, I decided to do a quick search for other members who had the word “homebirth” in their tags. I came across three women fitting that description and sent them an invitation to be my “friend” (similar to “friends” on MySpace, etc.). One of them, named Christina (om mamma on Maya’s Mom) – a mother, author (of “The Dharma of Motherhood”) and speaker – responded to me after checking out my profile, invited me to her website and encouraged me to sign up for her monthly newsletter, saying she thought it was something I would enjoy. With Jody home from work and able to watch the kids today, I emailed back and forth with Christina a bit, then spent a good chunk of the morning browsing her site and reading her columns. It only me a quick glance around her site to realize she is exactly the kind of wise and inspirational mama I’ve been looking for and I immediately added her blog – Dharma Mum – to my blogroll. I believe mothering does not have to be as difficult as we are led to believe. I invite every mom to consider the benefits of bringing meditation and gratitude (amongst other things) back into your lives – to ground and centre the experience in deep meaning and with honour. I’m sure I’ll be blogging about some of her writings/philosophies in the days/weeks ahead, as I think I can learn a lot from her, but in the meantime please feel free to check her out on your own. Feb. 11 is my 2-year blogging anniversary. Wow! Time flies when you are having fun, huh? I think I’ve managed to raise awareness over the past two years. I write about the issues that are important in my and my children’s lives, which most recently have been pregnancy, natural childbirth, home birth and the ever-relevant topic of breastfeeding. In viewing my stats, I’ve noticed that numerous people come to my blog after doing a search for topics such as “nursing toddler,” “extended nursing,” or “nursing while pregnant.” There have also been frequent searches for “plugged duct” or “mastitis,” or things related to “pregnancy,” “hypnobirthing,” “home birth,” “circumcision, “vaccinations” or “Attachment Parenting.” I hope that something I’ve written in the past two years has helped or touched someone in their parenting journey. I also get many visitors to my blog in search of recipes, which delights me as well. I enjoy sharing the tasty meals I come across. Also along the lines of raising awareness, in 2005 I started the Attached At The Hip online store, featuring advocacy wear that supports Attachment Parenting ideals. From August 2005 to today, I’ve sold over 1,100 items, including shirts, bibs, bumper stickers, etc. My biggest seller (which I happen to be quite fond of – see below 😉 ) is the “I make milk. What’s your superpower?” design with over 130 shirts, stickers and tote bags sold to date. My profit from the store sales is only a couple dollars per item, so I’m not in it for some quick money, but it makes me happy to know that so many people around the world (I’ve sold to people in Australia, Canada, Great Britain, the Netherlands, Slovenia, Uzbekistan, as well as 47 of the 50 U.S. states) are interested in spreading the word about breastfeeding and other AP ideals. With regard to my blogging, someone once told me “â€¦you arenâ€™t going to change the world.” I disagreed at the time and I disagree today. I may be only one person, but I know I can make small changes for the better here and there, and that’s really the only way the world is going to change – a little bit at a time. Thank you to those of you who’ve been with me and supporting me for the whole two years and to those of you whom I’ve met along the way. I’m happy to be on this blogging journey with you. Posted on February 10, 2007 Author amygeekgrlCategories Activism, Alternative Medicine, Attachment Parenting, Breastfeeding, Favorite Links, Home Birth, My Life, Natural Childbirth, Parenting, Pregnancy8 Comments on Blog-iversary – 2 years! Since I started my blog nearly two years ago, several of my (real life) friends have started up blogs of their own. They are all in my blogroll, but I wanted to give a shout out to them here too. 🙂 Hi, ladies. It has now been nearly four weeks since the tragedy of Hurricane Katrina. I had not yet posted on this topic because I felt ill-equipped to comment on it. I don’t live near any of the affected areas, I don’t personally know anyone who was there. I only know what I see on the news or read on the internet, which I have to admit, hasn’t been a lot because I rarely watch the news and I haven’t been seeking it out on the internet until recently. Immediately after the devastation, there was talk on several of my message boards – people wanting to help in any way that they could. Many organized relief efforts in their own small ways. One woman volunteered to accept clothing donations and notified others in her area of where trucks accepting donations could be located. Another woman asked for donations and tried to find jobs for a displaced family who would be staying in her city. Another asked for donations for a family that was staying with her sister. A coworker of Jody’s promised to match any donations people make to him before passing the money on to a charity. Another coworker, a dog lover, is making plans to travel to Louisiana to assist with the animal rescue efforts. It’s heartwarming to see people doing whatever they can to help with the efforts. I can’t imagine being in the situation that so many are. Many lost everything in the storm, including pets, family and friends. My heart goes out to those who were affected. I can’t imagine being stranded on a rooftop for days, without food or water, while helicopters flew overhead. I couldn’t believe that several days after the hurricane, there were still people stuck in situations like that. How many survived the storm only to die waiting for help? It’s incomprehensible. I decided a few days ago to start a small collection of informative links regarding Hurricane Katrina. Yes, it’s been nearly a month since the disaster took place, but we can’t forget that these people will continue to need help for quite some time. If you have a link that you feel should be included here (especially regarding any families you know in need of help or donations), please leave me a comment with it. Thank you. I read today that many people who’ve finally been allowed back into New Orleans are now being evacuated again as Hurricane Rita approaches. I can only hope this hurricane weakens as it approaches land and doesn’t cause any more damage or fatalities. A very brief collection of Katrina sites/stories. — Hurricane Katrina and holocaust: Slow response or deliberate extermination? — Locally, three Great Harvest Bread Company stores donated 100% of bread sales on Sunday, Sept. 11, to Katrina Relief. The stores are usually closed on Sundays, but they opened for several hours on Sept. 11 to sell their two most popular types of bread for $5/loaf to raise money. They made $26,000. — Jody‘s work matched any contributions made by employees. The company was able to send $10,000 to relief efforts. — An Open Letter to Health Care Providers Attending to Families Affected by Hurricane Katrina: The Role of Human Milk and Breastfeeding – Why it’s so important that women who are able to breastfeed do so, especially during disasters. “Human milk is a valuable resource that can not only protect the vulnerable infant from disease, but can also promote psychological health and comfort during stressful times. Human milk reduces pain and promotes more rapid healing after injuries and infections. While maternal health is of great importance, it should be recognized that even the malnourished mother will produce milk of good quality for her infant.” Also worth noting that when there isn’t clean water to mix with formula, breastmilk is always readily available. Also, human milk banks are “available to provide milk to Katrina Hurricane victim babies/children with a medically indicated need for human milk and who do not have their own mother’s milk available.” As a result, there is an increased need for donor mothers. If you have a large amount of breastmilk stored and don’t see an immediate need for it, please consider donating. 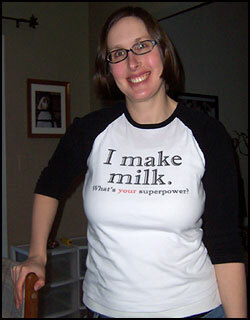 HMBANA (Human Milk Bank Association of North America). Our hearts are with the people whose lives have been directly affected by Hurricane Katrina. Please help us spread the word that HMBANA milk banks are available to provide milk to Katrina Hurricane victim babies/children with a medically indicated need for human milk and who do not have their own mother’s milk available. This will also require an increase in donor mothers. Help us inform interested lactating mothers, especially those in states with milk banks to call their nearest donor milk bank for further information. Approval as a donor involves a triple screening process beginning with an initial phone screening for medical, dietary and lifestyle factors which might make the donor ineligible, followed by written documentation of their medical history and a signed medical release to be sent to both mom and baby’s health care providers, and last would be the willingess to have blood work drawn. Our screening process is similar to those used when one donates blood. I am most grateful for your assistance in this matter. Thank you for reading. And thank you to everyone who has done their part (big or small) to help the victims of Katrina. It’s wonderful to see the goodness in people when they band together for a common cause. Peace. I’m happy to announce my new store (through CafePress) – Attached At The Hip – is NOW online! Attached At The Hip sells primarily advocacy clothing, stickers, buttons, etc. with logos that promote attachment parenting ideals such as breastfeeding, baby wearing, gentle discipline, natural birthing and more. I’m very excited to get this off the ground and, while I am hoping it will be a profitable venture for me, I am also just glad to be spreading the word about attachment parenting. I’m currently offering a special of $5 off any purchase of $50 or more. Use coupon code: B2SALE when you check out.